By Gordon Frickers 40 x 50 cm (15¾” x 19¾”), available, £1,200. You have found one here. Grab it while you can. Painted on location, typical of untypical properties in the remote mysterious L’Occitaine region of Midi-Pyrénées. I’d carefully chosen my subject and view during a previous walk. While working in the company of another artist, chance played its hand, The owner came out to see the happening. He invited us to his chateau, a warm friendship developed. At the time the property was owned by the very hospitable Claude and Sylvie Picault. Claude Picault, a real gentleman with his wife the warm, hospitable, Sylvie, charming. 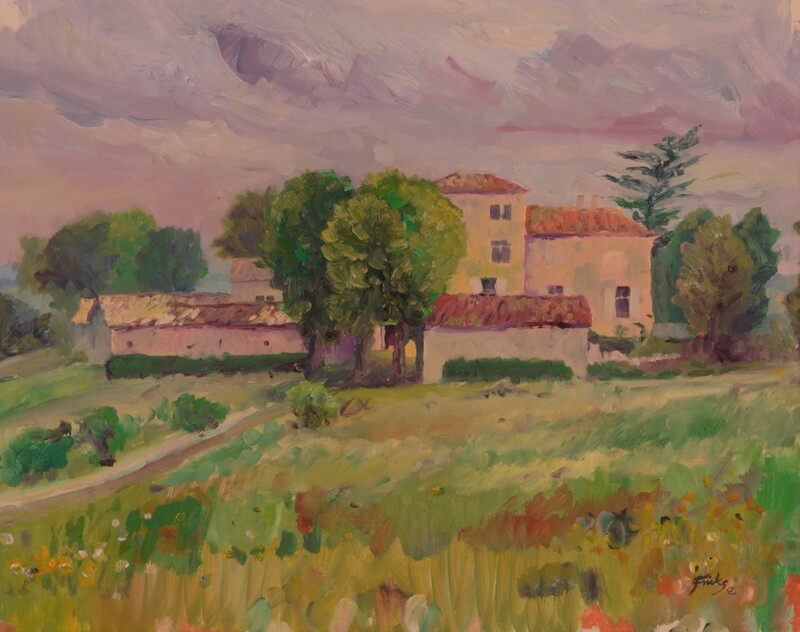 Claude was a former deck officer who I met when by designed chance when I painted’ plien aire’, his chateau near Castelnau de Montmiral. Claude had sailed with the Companie Generale Trans-Atlantique, became a friend and commissioned two marine paintings, one of his last ship, the ex Liberty class ‘Trun‘, the other of his family yacht. Of the latter, Sylvie said, “a very nice yacht, at it’s best 60 km inland in a field“… The painting showed Nizou IV sailing off Sicily, family on board. You can find this beautiful painting in the ‘Archive, Marine’ section.